Wedding rehearsal dinner invitation etiquette is a great way to invite family, the wedding party and friends for an evening of fun and relaxing the night before the big day. The wedding rehearsal dinner is traditionally held immediately following the wedding rehearsal. So, naturally the parents of the bride and groom, the wedding party and family are invited. The wedding officiant is also invited, however due to time constraints, they may not be able to make it. 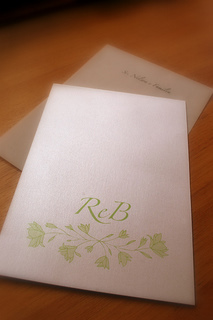 Wedding rehearsal dinner invitation etiquette has traditionally had the parents of the groom hosting the event. In more modern times, the bride and groom can host the event themselves. It all depends on budget, distance and time constraints. The wedding rehearsal dinner does not have to follow the formality or theme of the wedding. It can be a sit-down dinner or a backyard barbecue. It is a great time for the bride and groom to express gratitude to all the wonderful people who have helped them plan their wedding. There are a few ways that the invitation to the dinner can be extended. Because this generally isn't as formal as the wedding itself, invitation etiquette shows that you can invite by paper, email or phone invitations. Paper invitations have been the most traditional method of wedding rehearsal dinner invitation etiquette. These can either be purchased or, using your creativity, created from scratch. They do need to be sent out 1 month before, so that your guests can plan and respond. The wording on an invitation does not have to be anything that has been set in stone. You can be as formal or informal as the dinner. The only thing that is set in stone is that you include the information about when, where, time, theme, date or not, and clothing and dress. It is definitely within wedding rehearsal dinner invitation etiquette to send out email invitations. This is a wonderful method to use, as it takes less time to reach a number of people. Using email etiquette when inviting to a rehearsal dinner is simply including the date, time, location, theme, date or no date and what to wear. It is easy to get an rsvp from an email too, as the recipient just needs to send out a quick reply. There are email invitation websites that you can use. These will give you options on the look and feel of your invitations. When you are extending an invitation over the phone, use good telephone etiquette. This is a time when you do not want to leave the details in a message with the invitees children. Make sure you talk to the person that you are inviting. This way you can give them all of the information: date, time, location, if they can bring a date, theme and what to wear. If you have a number of invitations to extend, recruit some help. This way you are not spending all day long on the phone. Make sure, if possible, that the invitations are extended 1 month before the dinner.